The Descendants is styled after works from the Bronze Age of Comic Books, a time before superhero comics were dominated by grim and gritty deconstructions; when comic books were fun. It is presented in a unique manner: as an all-prose comic book complete with issues, specials and annuals. Each tells a complete story that ties into the overall tale of the titular superheroes. In the first exciting volume: Three friends discover the their old school, The Psionics Training and Application Academy is actually a front for a clandestine organization dedicated to exploiting young people with powers rather than helping them. They band together, managing to rescue a small group of such people, bringing them to Mayfield, VA for safekeeping. Unfortunately, fate puts them in harm’s way from new and dangerous sources beyond what they were already facing; from a resurrected sorceress, to the local crime boss, and a mad-woman with powered armor and a robot army! If our heroes want to live, they’ll have to learn to come together as a super-team and as a family. 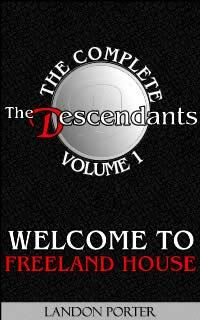 Collects the entire first volume of the webserial, including The Descendants #0-12, Descendants Special #1, and Descendants Annual #1. Bonus content includes the short story Who is… The Whitecoat?, and the Rise of Morganna miniseries. Content in this collection was previously published in the ebooks We Could Be Heroes, Tome Attacks, and Rise of Morganna.